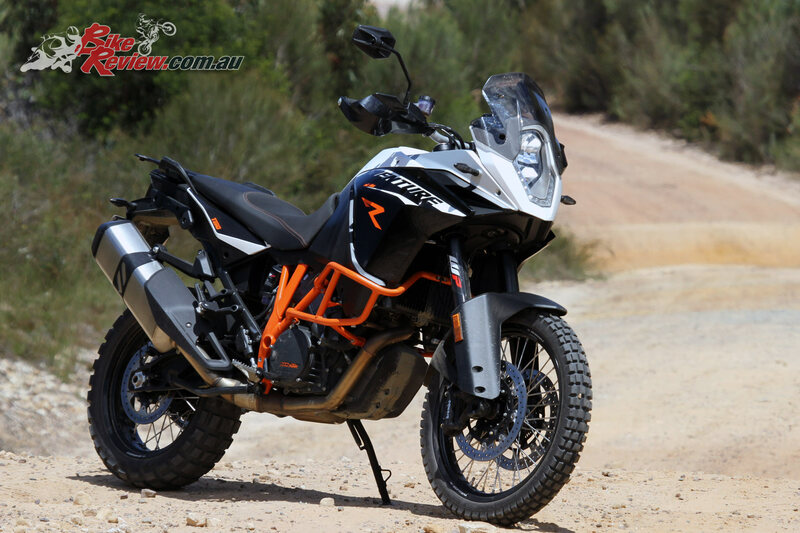 My first impression of KTM’s 2016 1190 Adventure R was that this is one very impressive looking machine. 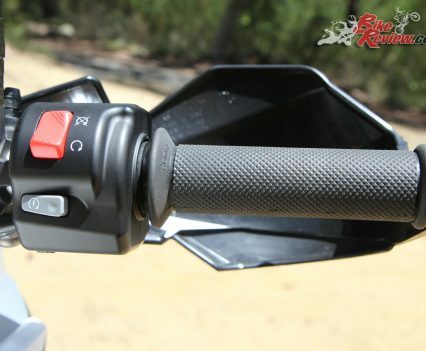 The build quality is great and commonsense ergonomics include solid handguards and a sturdy rack, ensuring protection and easy luggage addition. 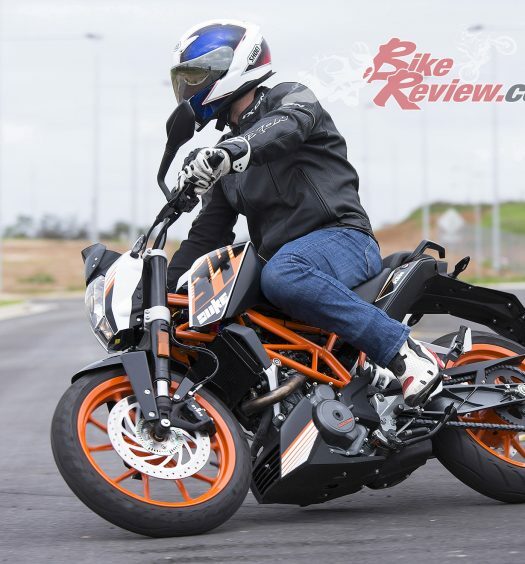 The vivid traditional KTM black/white/orange colours also look both good and a bit menacing at the same time, with minimal orange details like the trellis frame, branding and rear shock spring. 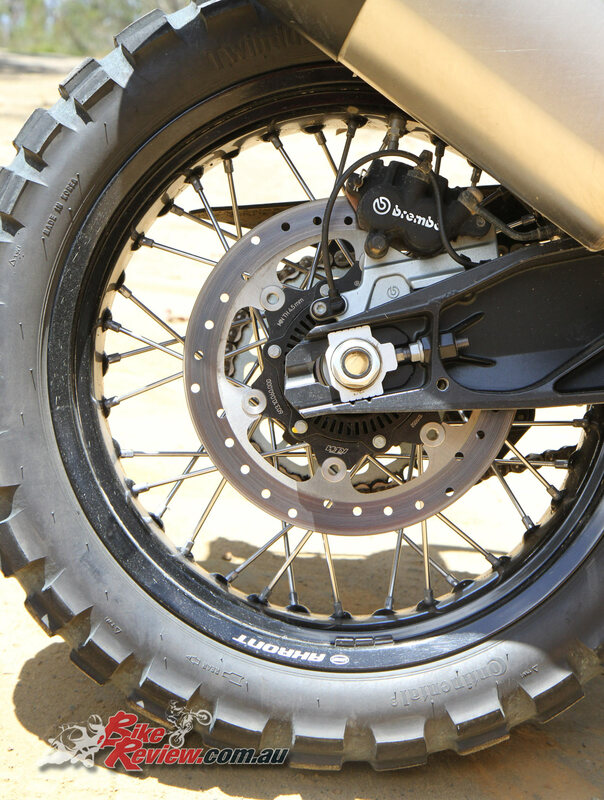 Standard fitment knobby tyres certainly speak to the Adventure aspect of this models name, while high quality components include full Brembo brakes and very adjustable WP suspension – no doubt confirming the engineer’s goals. My first ride was in the suburbs, which highlights the Adventure R’s dual purpose nature, with strong road capabilities naturally a must. 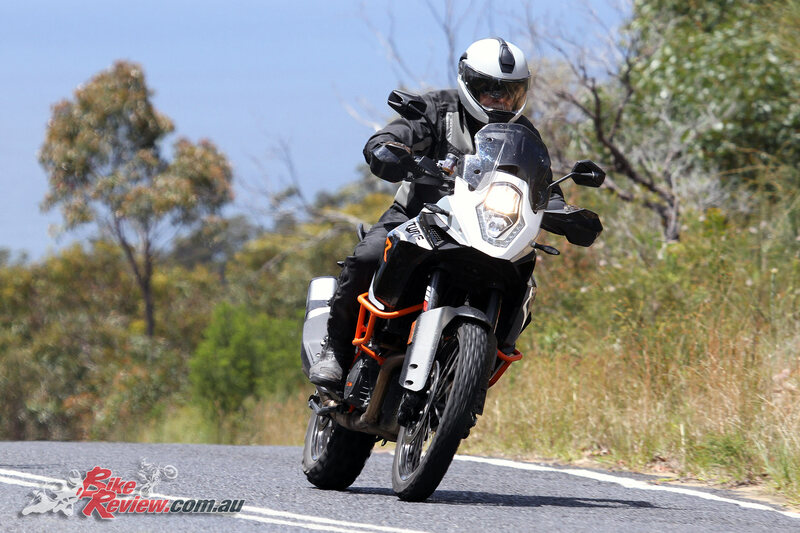 The 1190 Adventure R features a V-twin 1195cc donk with a Keihin Ride-by-Wire system and was very smooth and powerful, with 147.5hp on demand according to the manufacturer. 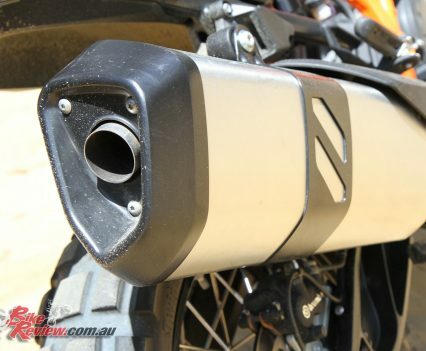 It’s also very torquey, which is my personal pet love when it comes to motorcycle engines. This is matched to a six-speed gearbox which was excellent, offering ideal gear ratios and I missed just one gear during three weeks of full-on testing. 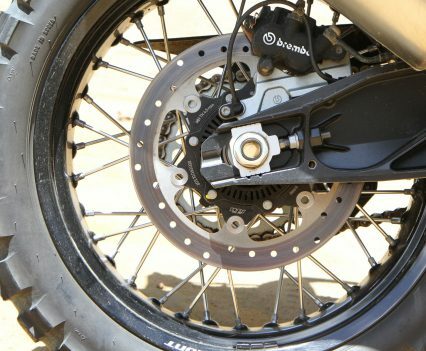 Naturally the Brembo brake system is excellent – what can you say, they are the best in the business! 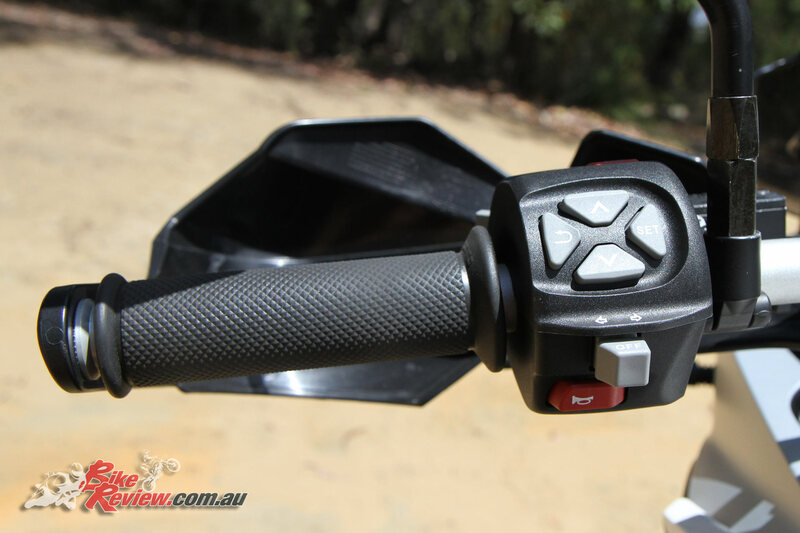 I initially thought the suspension at the rear was slightly too firm on the standard settings for my 95kg weight in gear, however as I rode the bike more I found the settings actually spot on. 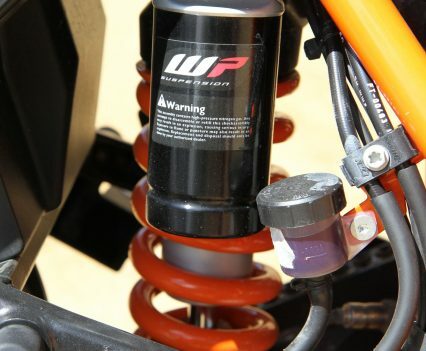 As noted earlier though, there’s plenty of adjustability in the WP forks and rear shock. 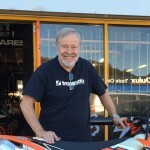 I’ve been the owner of sportsbikes from 1995 through to 2015 and I find the Enduro and Adventure bikes both have a much more upright and comfortable riding position, which my old bones welcome. 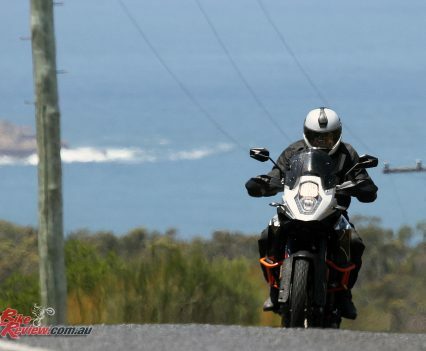 Now I’m just asking myself why I didn’t ride one of these machines to Phillip Island from Sydney for one of my trips there in the last 20 years? Maybe next year! 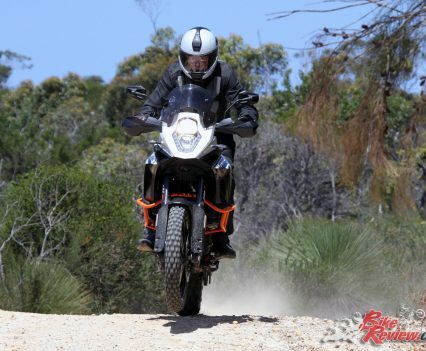 A few other things I noticed was that with a height of 185cm I had an immediate feeling of anxiety handling the Adventure R in awkward situations like on loose gravel, where the high seat height and centre of gravity come into play. The seat height is 890mm. 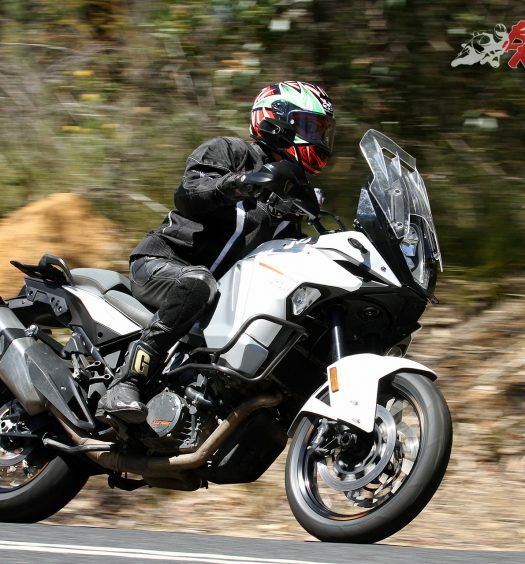 The Adventure R feels particularly heavy despite only being around 35kg heavier than the sportsbikes I’m used to riding, with the difference in seat height and centre of gravity being very different. 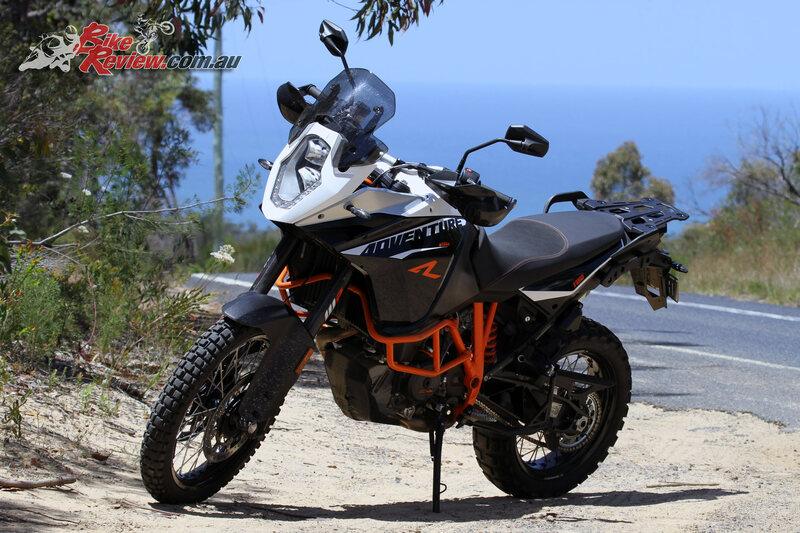 My current bike is a 2016 KTM 500 EXC, which in comparison to the 1190 weighs just 110kg. The long wheelbase for that off road stability was also noticeable, I also noticed the length, on the bike, with the distance to the windshield and instruments making it hard for me to read the dash. It may be easier if you don’t wear glasses like I do however. There was also some heat noticeable on the back of my thighs, which was worse on the left, both on shorter suburban rides on a 20-degree day as well as when traveling at a slower pace on the really gnarly dirt roads, but nothing too bad really. 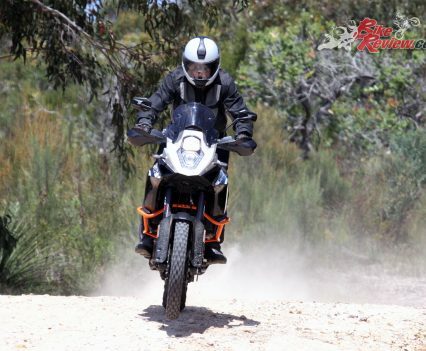 Of course the design brief for the 1190 is rather different and not really intended for soft sand or single track but remains very capable indeed on bitumen, gravel roads and even twin track. 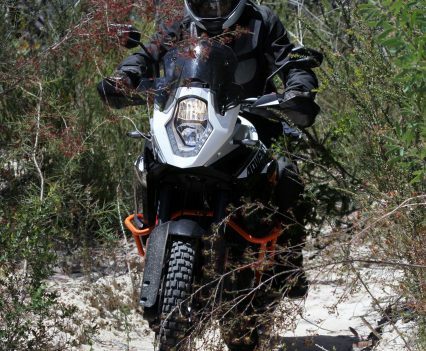 Having ridden to Cape York in 2011, I think the 1190 could do it with a good rider despite the creek crossings and sandy tracks. Also having ridden last year from Birdsville to Alice, Finke and back I think the 1190 would be challenging over the dunes especially without a backup vehicle carrying your gear, as there is a lot of very fine sand! 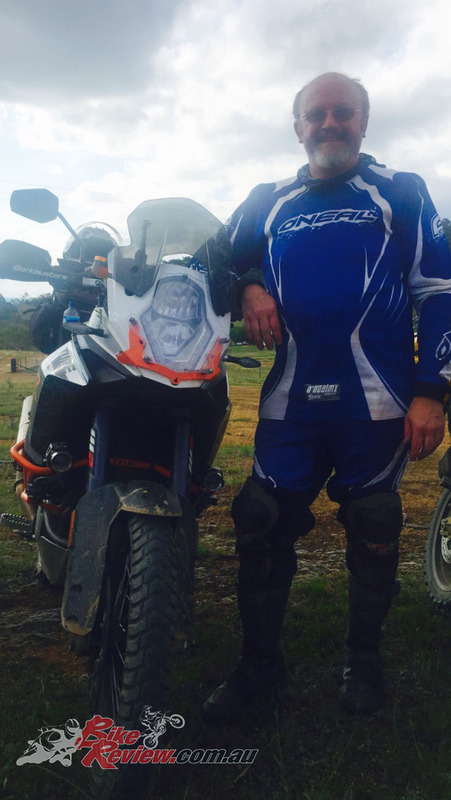 However I am told that Daryl Beattie rides the Africa Twin which is not dissimilar in mass through there, so it must be possible. 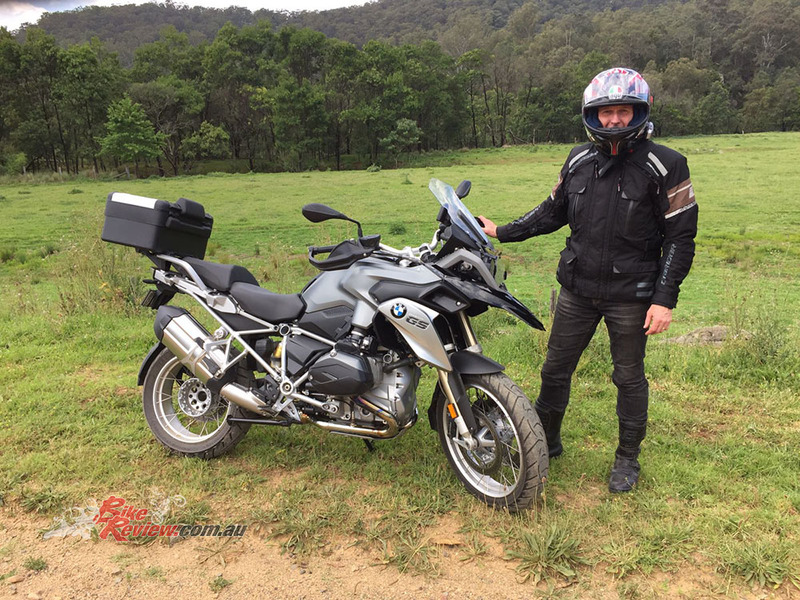 Testing the Adventure R across a number of conditions it showed great strengths, with sealed country roads traversed on Sport mode, with the great brakes, great handling and cushy riding position all coming into play. I was a bit anxious with the feel of the adventure tyres but never had any issues with grip. 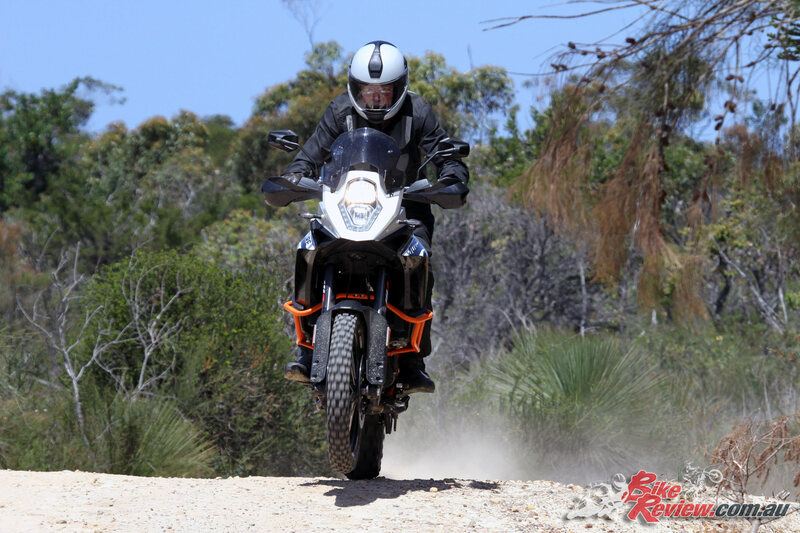 On gravel roads the Adventure R’s enduro roots really show through, giving me great feeling and confidence on the Enduro mode. 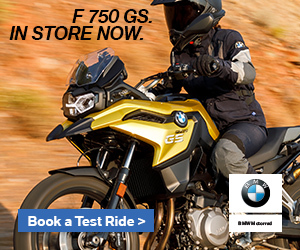 The ABS is reassuring, and the engine offers good torque but reduced power helping keep the bike manageable and really tractable. 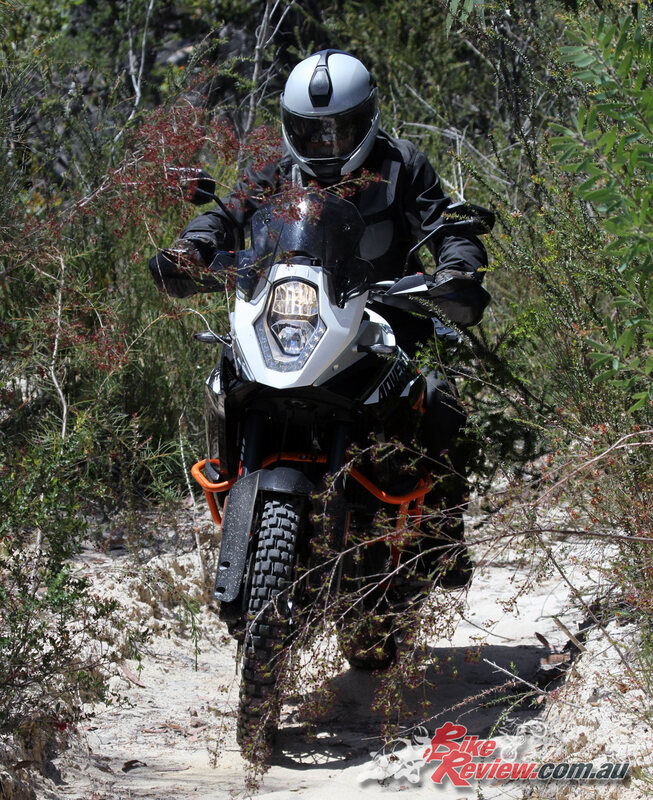 This was particularly true on the really gnarly dirt roads, and I talked to an owner who rides his Adventure R on single tracks without issue – like Chris Birch, which is something I’d like to see. Even through bumpy tarmac twisties with plenty of road damage the Adventure R proved formidable on the Sport setting, with awesome power and the soft suspension swallowing the bumps in its stride. The brakes and handling in that situation were superb and helped by the wide ‘bars and it was the bike’s most impressive performance so far. While I started in the suburbs and disliked the start and stop traffic, tall seat height and high centre of gravity, throwing the Adventure R in the deep end in the countryside, it just got better and better. Through my regular testing areas it was also a real hero, and giving the Adventure R the berries during a few long corners during shooting was a hoot. 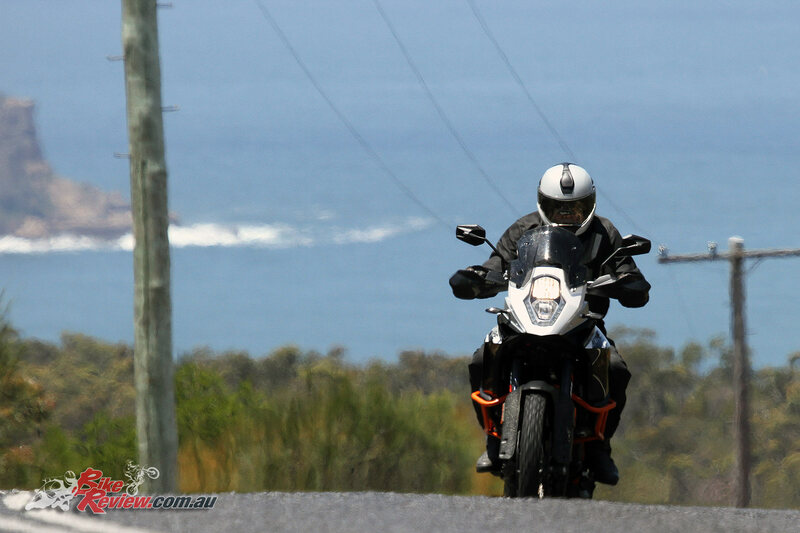 I may have been anxious about the tyres but the bike went well with good feel on Sport on the bitumen. 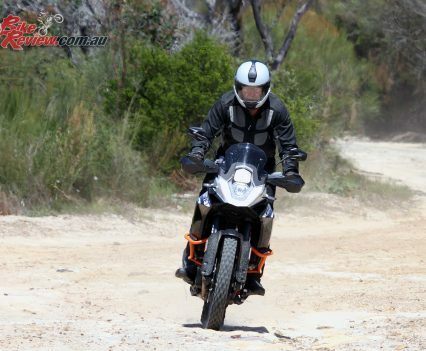 Over a rough gravel road in poor condition with drainage crests in the Enduro setting proved fun, and I found the standing position best for the crests, becoming quite comfortable at speed. Even U-turns on some of the narrow gravel roads we traveled, including sandy sections proved doable despite the heavy and high bike, and the front washing out over the sand. 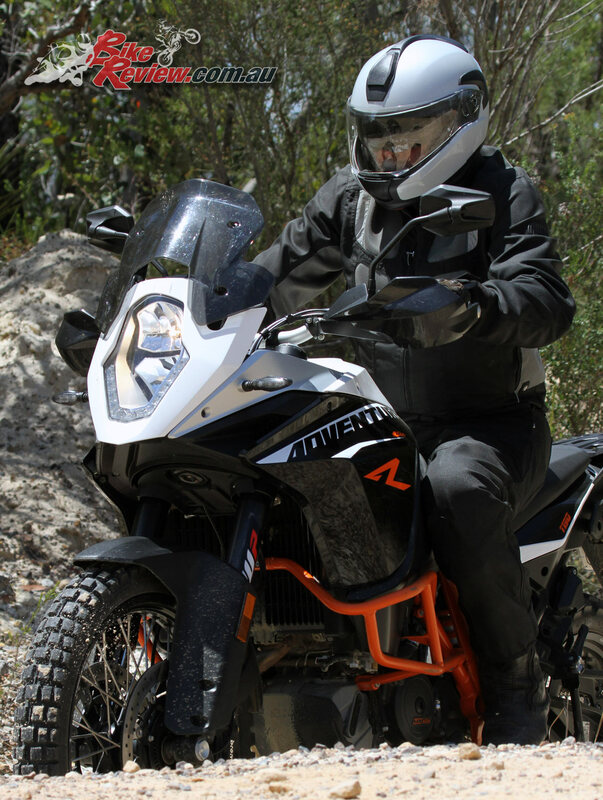 I found I could anticipate and correct for the sandy conditions once I became more used to the Adventure R.
In fact the more I rode the Adventure R, the more the bike impressed me and increased my confidence in its capabilities, despite the size and weight. 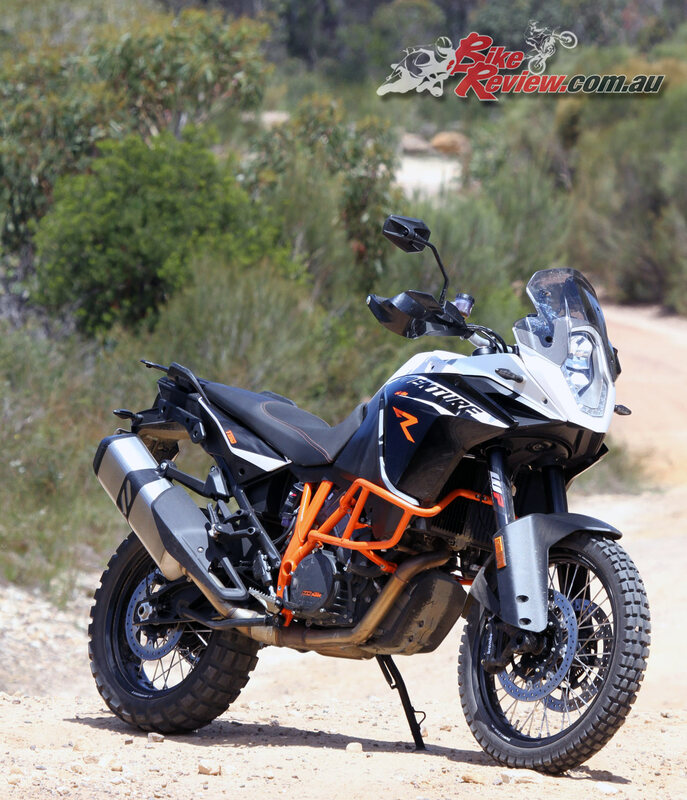 I really think the Austrian engineers and designers have nailed it with the 1190 Adventure R.
If I wanted to tour Australia this is about as good as it gets and currently for $24,990 + ORC you also currently get a bonus $2000 from KTM to spend on KTM Power Parts! 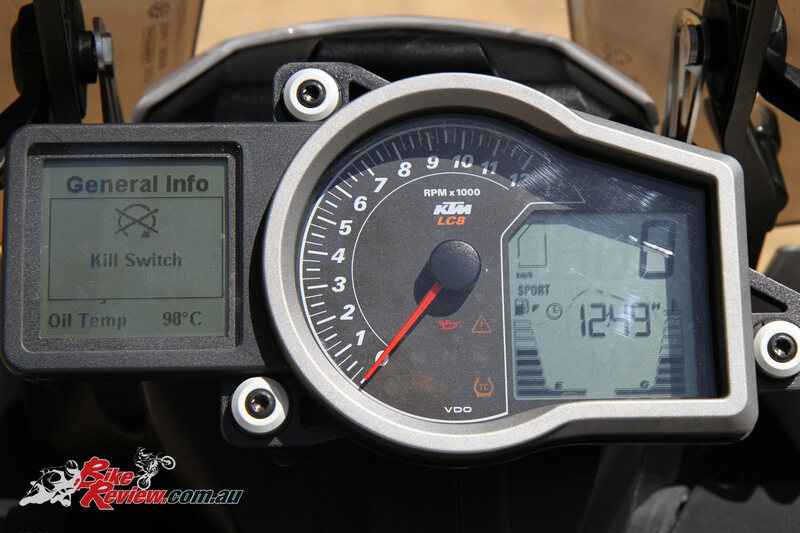 Sure if like me, you are under six-feet tall, the 1190 R will be challenging to ride but only under 5km/h! 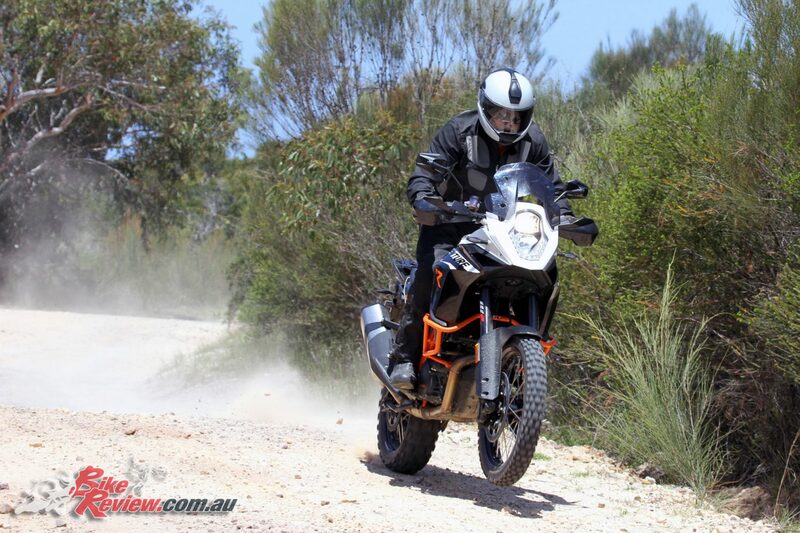 It’s hard to beat my R 1200 GS but this KTM does, at least off road. 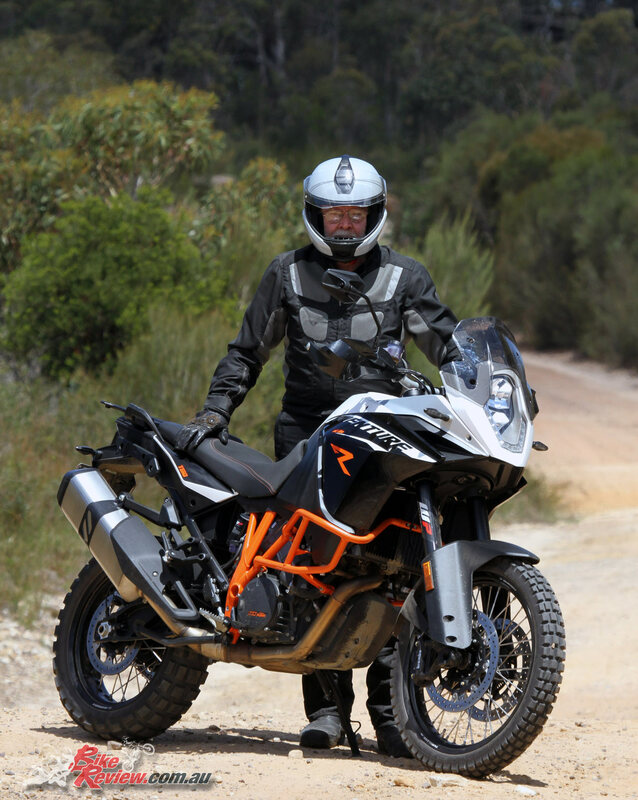 The ergonomics, weight, front wheel size of 21in and general KTM pedigree makes this the best big bore adventure bike I’ve ridden in the dirt. 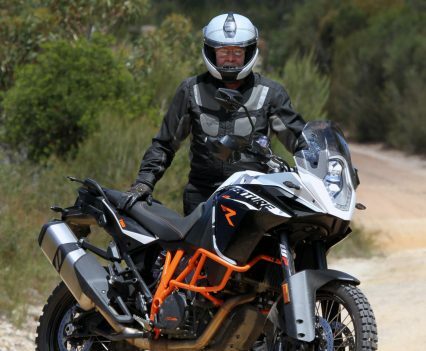 On the tar the KTM has a great engine that produces more power, has just about the same level of gadgetry and technology as the GS, and still handles well in the corners – even with the off-road oriented tyres. 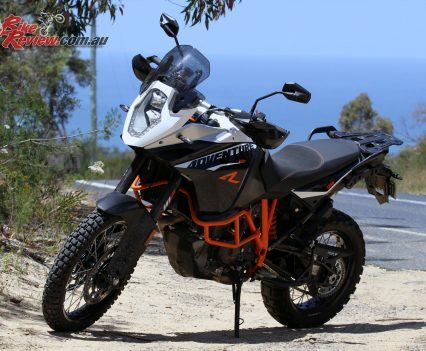 If I didn’t have a KTM 350 EXC-F and could only have one bike for touring as well as off road adventure this would be high on my list. I still wouldn’t be taking it far off the main fire trails, though apparently some can, and do – good luck to them! I’m in my mid-50s and at the time I was riding two bikes to satisfy my road and adventure riding, a GSX-R1000 and a V-Strom 1000. It didn’t take long to realise after test riding my mates 1190 Adventure R that I was destined to own one of these magnificent bikes. 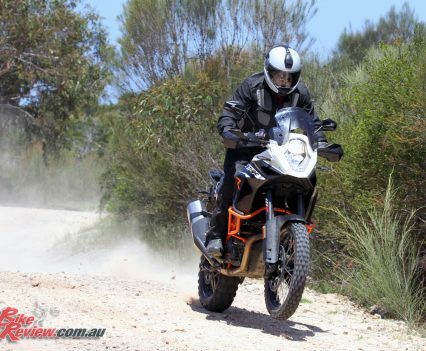 Soon after I sold both those bikes and bought one 1190 Adventure R and this bike meets all my riding needs as it is a very capable sportsbike and adventure bike all in one. I just have two sets of standard rims, one with road tyres (Continental TKC 80 front and Mitas E09 Dakar rear) and the other with off-road tyres (Continental Trial Attack 2s). So depending on what rides are organised like a blast up the Oxley Hwy or a country dirt ride I change setups to suit. On the road it’s a weapon, even with a 21in front wheel the Adventure R handles like it’s on rails. 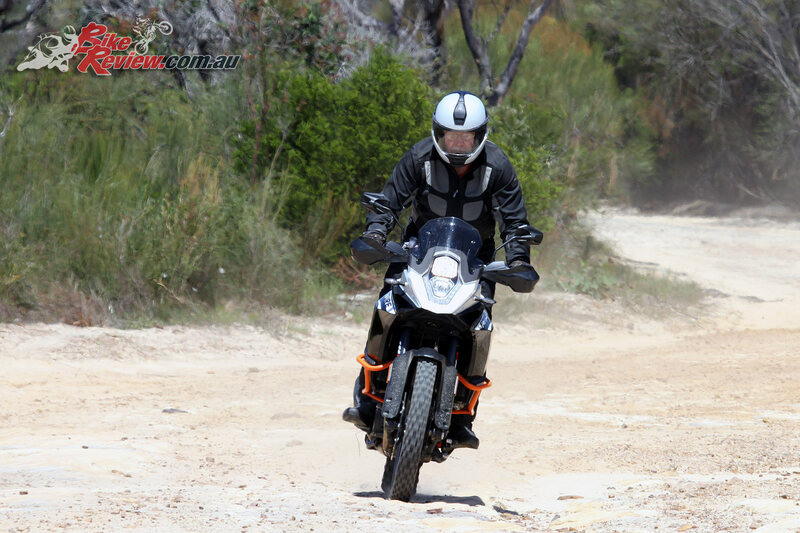 The relaxed riding position is perfect for twisty roads, while the brakes and suspension are great. 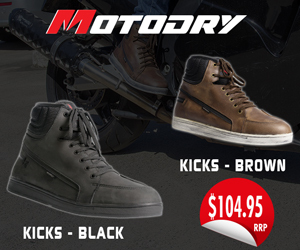 The bike’s easy to throw around with amazing torque and revs in sport mode – the ultimate hoon machine. 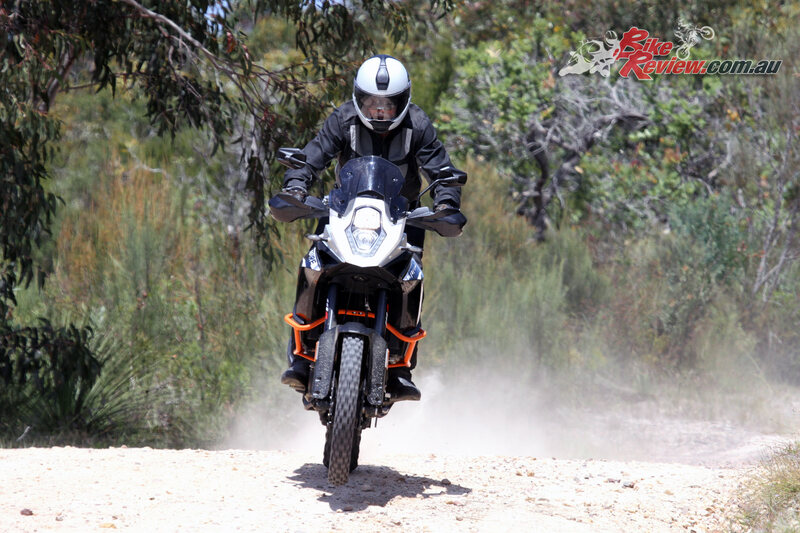 Off-road it’s an enduro bike on steroids with power plus and lots of fun to be had. 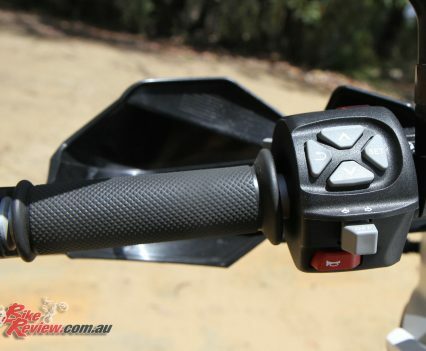 It has a great selection of modes to scroll through to keep traction at its best, regardless of the conditions. You just have to warn riders behind you, huge amounts of power is delivered to the rear wheel and following riders will be pelted with rocks! After 27,000km it’s the perfect all rounder. The only real drawbacks are the fact it’s a little tall and top heavy, and can get hot under the seat in traffic. 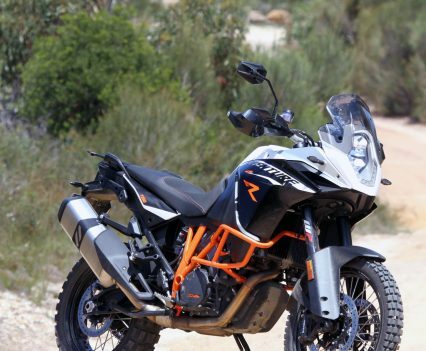 The KTM 1190 Adventure R is powered by a liquid-cooled 1195cc V-twin DOHC, four-stroke, with a bore and stroke of 105 x 69mm, with a six-speed transmission delivering 110kW. 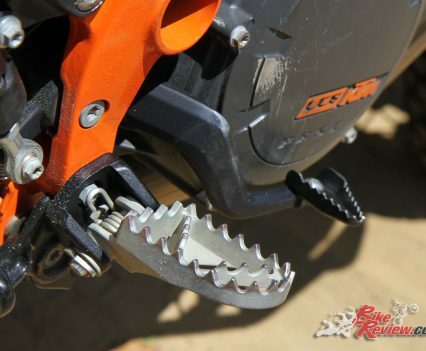 There’s also a PASC slipper clutch with softer clutch springs meaning just one finger clutch operation and a Keihin Engine Management System (EMS) and Ride-by-Wire with twin-ignition offer ride modes and traction control, which is lean sensitive. 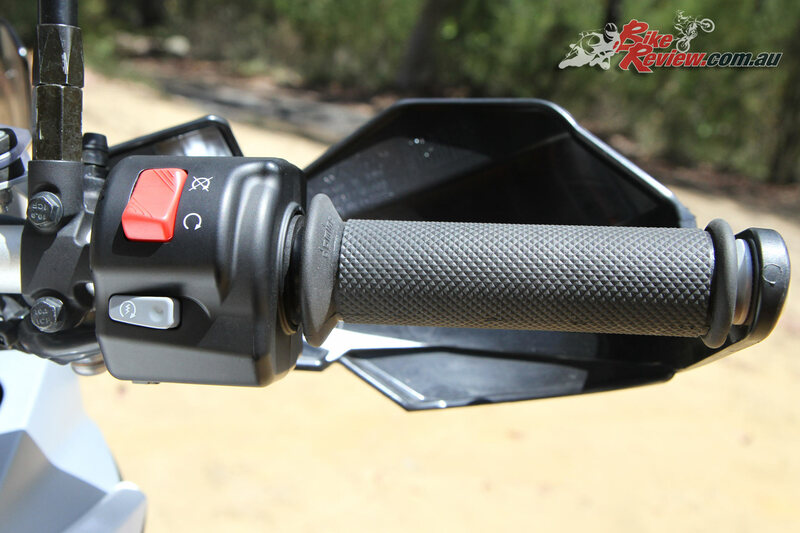 In wet and offroad modes power is also reduced down to 100hp. 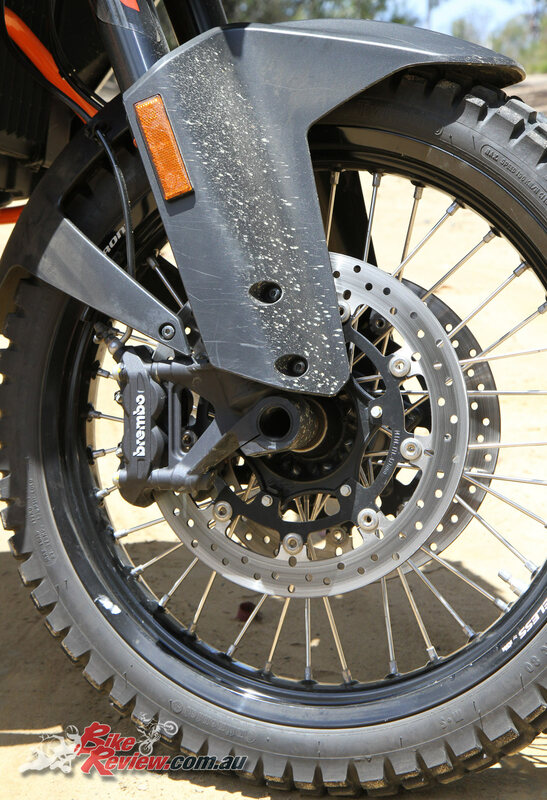 The Combined ABS (C-ABS) system also features an offroad mode, and is based on the Bosch 9ME including lean sensitive cornering ABS. A steering damper keeps 150hp and 125nm of torque mainly in a straight line unless you prefer it sideways or on the back wheel. 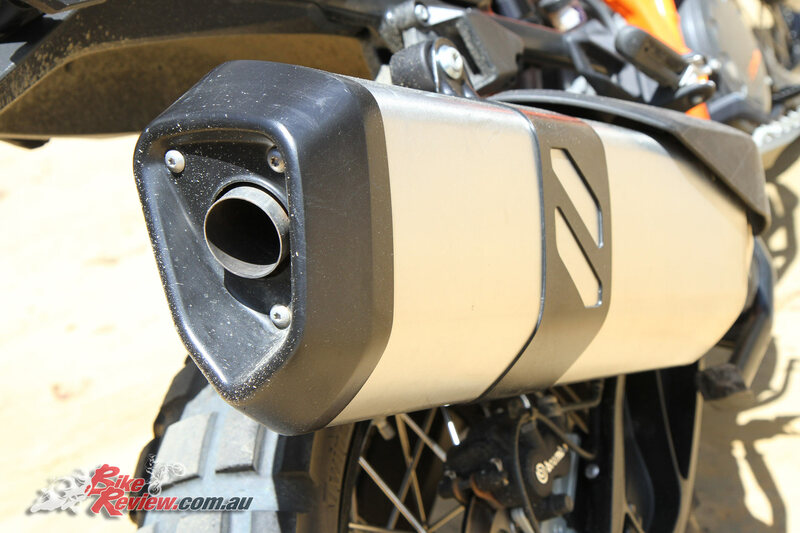 They have also improved the 2016 bike with a bigger 23L tank, and improved fuel consumption by per 20 cent. The seat height is also lower, with adjustable ergonomics, tyre pressure monitors, an alarm and extended service intervals of 15,000km. 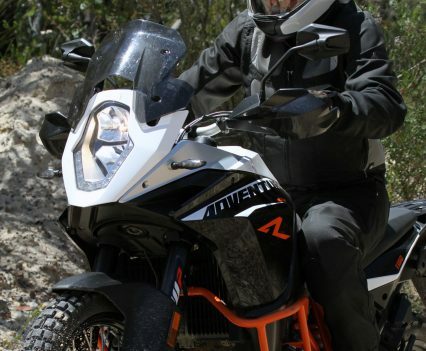 The chassis is a chrome-molybdenum stainless steel trellis frame, with 21in front and 18in rear wheels, which are spoked but feature KTM’s patented airtight rim beds. 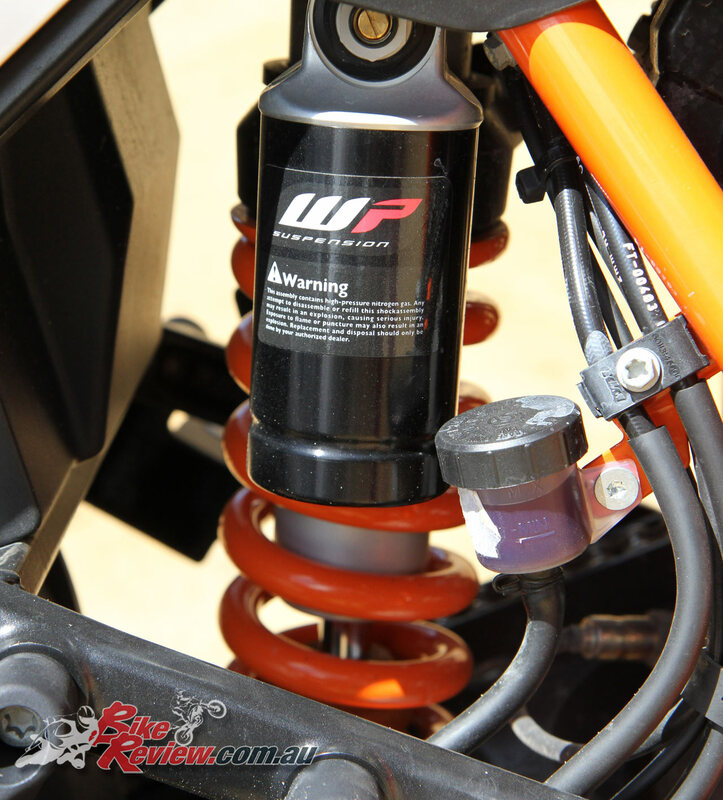 Forks are 48mm WP items, fully adjustable, with a WP shock on the rear end, with 220mm travel on both ends. 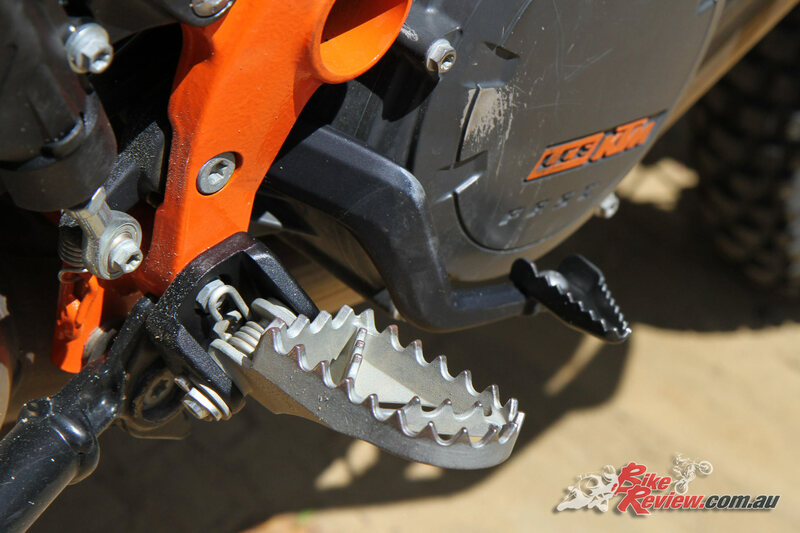 The swingarm is a die-cast open-lattice item. 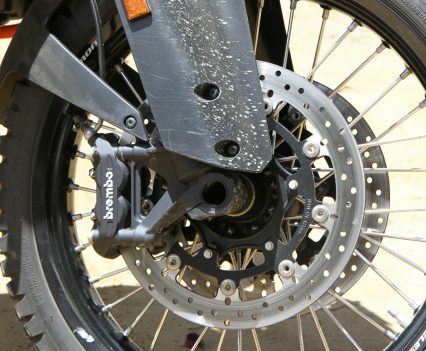 Brakes are full Brembo items, with dual 320mm front rotors and four-piston calipers, with a 268mm rear rotor. 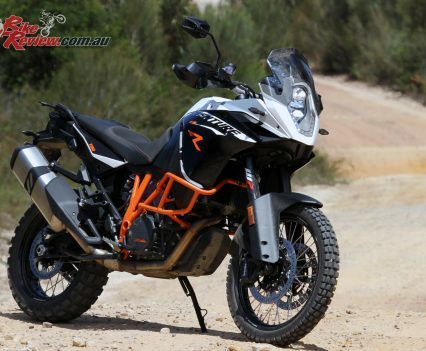 Price: $24,995 + ORC (you also currently get a bonus $2000 from KTM to spend on KTM Power Parts).